WE Bike NYC July Newsletter! 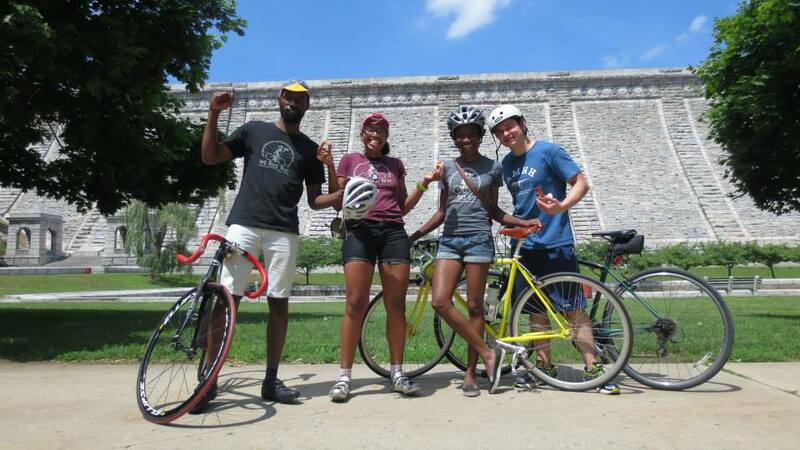 WE Bike NYC is up to great things this summer! Join us! It's true. WE can't all be WE Bikers. Some people live outside New York City, some are men- and not allowed on a lot of our rides (sorry guys), some people haven't bought a bike yet, or haven't gotten out to a ride just yet, but the great thing is, anyone can be a WE Backer, and WE are creating more and more opportunities to be involved both on and off the bike! WE Bikers and WE Backers at the WE Boogie Up the Bronx ride in June. Last month, WE hosted our very first all gender ride in collaboration with the Bronx River Alliance and Boogie Down Rides. Over 30 people showed up and WE all boogied up to Kensico Damn Park- 45 miles round trip! Not to mention, Laura Solis appeared on News12 talking up the event and WE Bike NYC! Check out the segment here! This month, WE're starting our monthly Happy Hour event- Wet Your Wheel with WE Bike NYC! Join us from 6- 8pm on the third Tuesday of every month to meet new people, learn what WE're up to this month and just talk bikes! Our very first Happy Hour will be hosted by Red Lantern on July 16th. Come on out and bring a friend! Because in the end, WE can't do it alone, and it's nice to know, you've got our back! Thanks WE Backers! Help us keep WE Bike NYC free by donating to our efforts! Any amount helps! Interested in having a hand in how WE Bike plans rides and makes decisions? Join us on the 2nd Tuesday of every month for our officer’s meeting to find out how to get more involved! Register Now. Learn to fix a flat yourself! Even if you already know how to do this, it never hurts to practice and pick up a few tips from our professional female mechanic teachers! Bring your bike, tools will be provided. Fix A Flat kits available for purchase for $8. 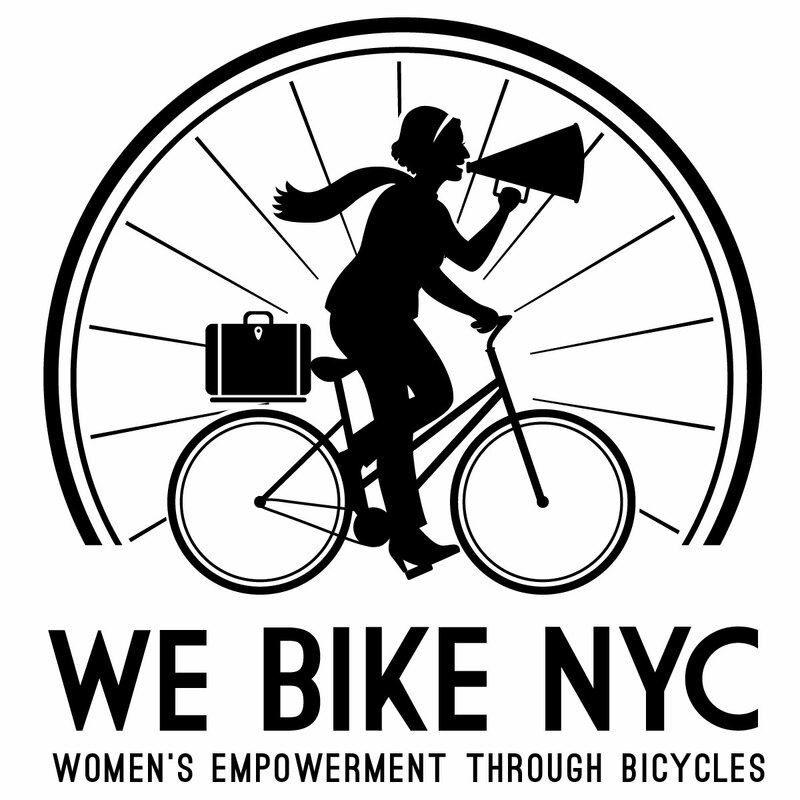 Please RSVP to liz@webikenyc.org. Aprende como arreglar una rueda pinchada! Trae su propio bicicleta, provimos las herramientos. Se puede comprar las llaves para $8 si quieres. Para inscribirse, manda un mail a liz@webikenyc.org. Se habla Espanol en este taller. We will meet at Madison Square Park (southwest corner) at 2pm, and we will bike to at least 4 different ice cream places in Manhattan, including gelato and a dairy-free option! It's a one chili pepper ride, so we'll go at a slow pace, but we WILL be riding in traffic, even though I'll do my best to plan a route with the most bike lanes possible. Bring cash for as much ice cream as you want to eat. Register Now. This is your chance to introduce all your friends to WE Bike NYC. They might not bike yet, they might be dudes, they might not be so into organized events, or they might be just dying to meet us! Whoever they are, WE're pretty sure they like a good Happy Hour! WE'll be hosting a happy hour on the Third Tuesday of every month this summer to provide a chance to hang out and meet new people. Join us! Meet at Christie and Delancy in the median on the South Side. WE'll start by talking about laws and rules for riding in the city and then move onto some important tips and tricks to do it in style. Finally, bring your bike and WE'll spend some time practicing locking up, dismounts and riding off in style! Please RSVP at info@webikenyc.org. WE'll meet at the Immigrant Movement International in Corona and spend some time exploring this great area. This ride is a one chili pepper ride and is great for new riders and beginners. Juntamos en Movimiento Immigrante Internacional en Corona y gastamos tiempo explorando este area. Este recorrido es un viaje social y apto para personas nuevas a las bicicletas. Hablamos Espanol en este recorrido. Para inscribirse, manda un mail a liz@webikenyc.org. Join us on the last Sunday of every month for brunch in a different borough. Meet new people, explore new places and ride your bike! This month WE'll be visiting Queens to join the Mujeres en Movimiento women in celebrating their graduation from a 10 week mechanics class taught by WE Bike NYC. WE will meet at 11am in front of Cigi Bicycle Shop located at 42-20 111th Street, Queens 11368. It is conveniently located three blocks from the 111 st MTA 7-train subway station. Please be on time, we will be leaving the shop at 11:15am. After our short ride we will have brunch at Banter Irish Bar and Kitchen located at108-22 Queens Blvd Forest Hills, NY 11375. Register Now. Exploramos una nueva area de la ciudad cada mes. Este mes visitamos Queens a celebrar la graduacion de las mujeres de nuestra programa de Mujeres en Movimiento. Juntamos a las 11 en frente de la tiende de bicicletas Cigi en 42-20 111th st. Esta super cerca al metro en 111th st, 7 tren. Por favor, llega a tiempo. Salimos para un recorrido pequeno a las 11:15 y llegamos a Banter Irish Bar and Kitchen para almorzamos (bruncheamos) en 108-22 Queens Blvd, Forest Hills, NY 11375. Hablamos Espanol en este recorrido. Para inscribirse, manda un mail a liz@webikenyc.org. Every month WE'll feature one or two events here, but be sure to check out our website and blog for more events and up to date info. Join women all over the country riding a metric century (100km)! 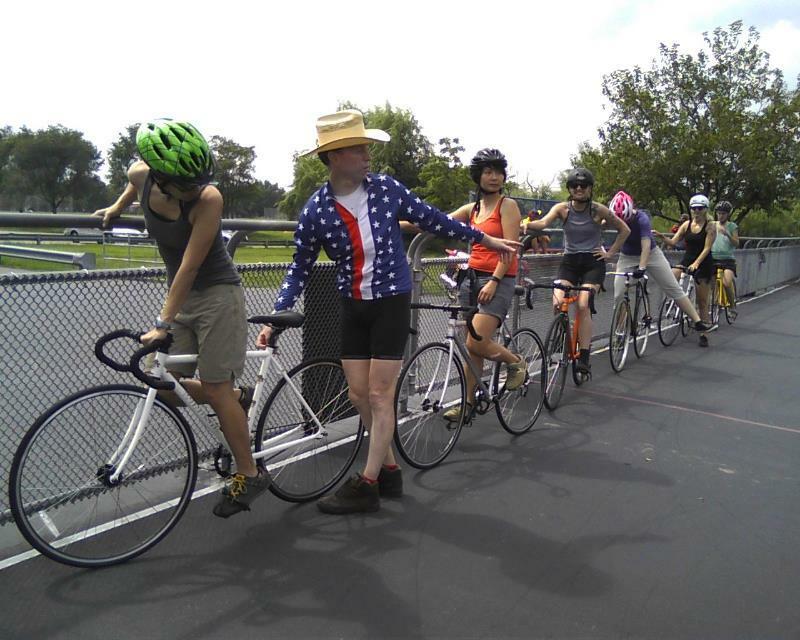 Join other beginners and try out riding a fixed gear where it all began- on the track! A limited number of loaner bikes are available, so register now! This is an amazing opportunity and SO MUCH FUN! Beginers welcome, but you should be comfortable riding a bike. If you have questions, or aren't quite sure, Registration opens on July 8th. Register Online. Here WE are at last year's track clinic! Copyright © 2013 WE Bike NYC, All rights reserved.